You have often seen him – it’s most often a he – while others bawls and toasts around him he lifts his glass to the light, turns and twists it and mumbles to himself. He studies and observes, like a magician in front of a magic love potion. To the uninitiated it seems ritual and geeky, but there’s nothing strange about it, whisky, you see, can be drunk with your eyes. Merely by observing how the whisky looks and behaves in the glass a whole lot can be said about it’s character and attributes. The first thing to observe is the color. The hue of the whisky often tells a great deal about how it’s going to taste. When whisky is filled into casks it’s colorless like water. The color, that in the final product can vary from light white yellow to dark brick stone red and even black, is exclusively derived from the cask. Depending on what the cask has previously held, how many times it has been used and the size of it will to a large extent influence both the taste and color of the whisky. In this context is caramel, E150, a true villain that makes things considerably more tricky. The whisky industry is to a large extent coloring it’s bottlings. The reason is simple, a certain whisky should have the same color no matter where and when it’s sold. The specific color is a mark of quality that is seriously guarded. Before bottling, a whisky is usually mixed, or vatted, from a large number of casks, and some casks has it’s contents colored more than others and in order to get the consistent end product the mix is adjusted with E150. Representatives from the industry usually claim that they use minuscule amounts of E150 and that this practice has absolutely no impact on the taste of whisky. It is quite obvious that this will penetrate and affect the whisky negatively, at least to some extent. Whoever claims differently should for instance sample Loch Dhu from Mannochmore, or it’s successor Cu Dhub, a coal black, debatable, bitter sweet experience awaits you. Probably about 100% of all whiskies are color adjusted. The big exception is single cask bottlings and products from independent bottlers and more exclusive limited distillery releases. Summed up all these whiskies amounts to a insignificant part of all whisky that is being sold. More or less all volume whisky is colored, basically all blends and virtually all standard single malts from Lagavulin 16 to Glenfiddich 12 comes with a dash of added color. This grim fact makes it hazardous to judge a whisky based on it’s color. But let’s assume that we have an uncolored, untainted by the industry, whisky in our glass. What can the hue tell us? American bourbon barrels won’t usually color whisky much. It turns pale, light yellow and with age it turns golden. European sherry casks might on the other hand color the whisky in a red brownish tint. If the whisky is reddish in color it’s not a hazardous guess that it has been sherry matured. The same colors can be derived from other wines that sherry, of course. During the last few years it has become increasingly common to finish whisky a shorter period of time before bottling by transferring the whisky to a red wine cask. Casks that has contained Port wine, Madeira, Marsala and so on grants the whisky basically the same colors that sherry will. Problems defining the type of cask by eye sight only will occur if the whisky has laid in new casks or if it has reached it’s middle age (or more). Even an inactive inoffensive cask will in time color the whisky. To be on the safe side one then has to do an age assessment. It is quite easy to see how old a whisky is, or at least, if it’s old. A trained eye can with reasonable precision conclude age. Especially if the whisky is served in a glass that the observer is used to. The explanation lies in chemistry. The longer a whisky lies in it’s cask the more taste compounds it will extract from it. Taste compounds are often heavy carbon-hydrogen compounds with long molecule chains. At the same time flighty substances evaporates. This results in the fact that the viscosity of whisky will increase with time. Old whisky will flow slower than a young. When you tilt the glass and let the whisky flow over the insides small “legs” will appear while the whisky runs back to the bottom of the glass. The more legs (they’re also called tears or curtains) the tastier the whisky will be, and the slower they run, the older the malt in the glass. A youngster will sprint quickly while the older will stride slower and with more class. Now, after we’ve pin-pointed cask type and maturation age, we move on to deciding the strength of the dram. With a few simple tricks this can be done with high precision. Again we tilt the glass, but this time we’re not looking at the curtain but at the “rod” it’s hanging from. 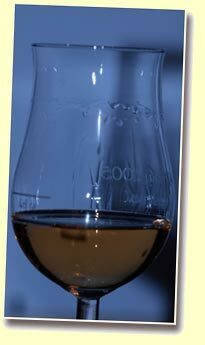 The line that has formed where the whisky has not been in contact with the glass is most often sharp and distinct. A alcohol strength of around 40% gives you an even “sweeping” line. The more alcohol the “spikier” the border line will get. When we reach up to around 60% of alcohol the line is a single necklace of tiny whisky pearls. Again the explanation lies in chemistry, it’s about surface tension that diminishes when the alcohol level rises. If you’re fortunate enough to have a non-chill filtered whisky in your glass the alcohol strength can also be measured by adding water. If the strength is more than 46% alcohol the whisky will turn hazy with water. You see, most whisky that is consumed globally is drunk with ice. A hazy whisky is not considered aesthetic. So in order to avoid the haziness that occurs when water is added the whisky is chilled to around 4 degrees Celsius, sometimes a bit higher. Then a form of sediment is formed and filtered away. The downside is that these sediments also contain taste compounds that consequently also are filtered away. As was the case with colouring of whisky almost all whisky is also chill filtered. The exception is again independent bottlers and more exclusive bottlings that are aimed at a more demanding audience. But again, if the whisky is non-chill filtered it can easily be decided if it’s above 46% in strength by just adding a dash of water. Cask type, age and alcohol strength are in other words some of the things that you can get an estimation of without even nosing or tasting the whisky. As in all other areas it’s training that will decide how skillful one gets at it. So keep that in mind the next time you see someone that acts strangely, turns and twists his glass and lifting it towards the light. He – because it’s most often a he – is just practicing.